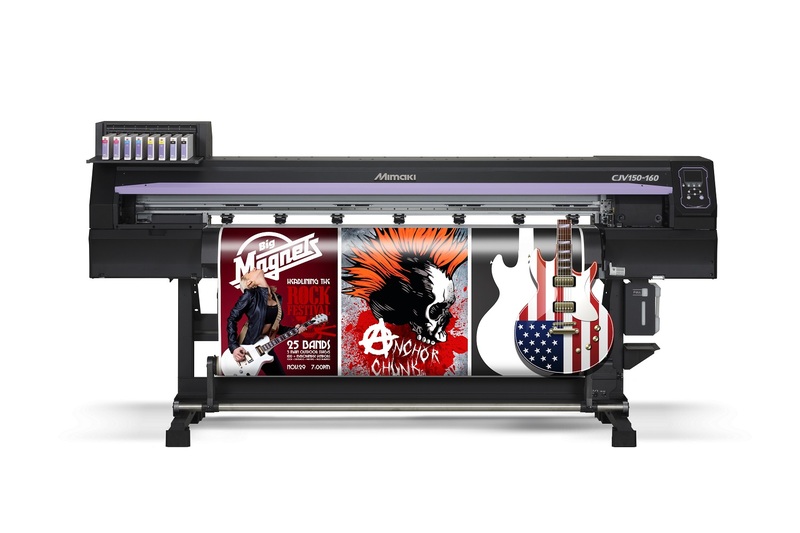 For most businesses in our industry, the purchase of a large format printer is one of the biggest investments you will make for the next few years. With that said, it’s something that shouldn’t be rushed into. Mistakes can be very costly; you could possibly even lose your business. You should be prepared to ask many questions and do lots of research to find which machine best fits your business plan. Below, we have outlined many topics and considerations to examine in you quest for the best printer for you, in the hopes of making your decision easier. Mimaki CJV 150-160. Prints at widths up to 63"
The size of your printer should be determined by the size of the largest item you currently want to print in one piece as well as what you may want to possibly to do in the future. Don’t buy a 30” printer if you want to print 48” banners. When we mention print quality, we are usually referring to resolution, the number of colors, and the RIP. Unless you are in the “photo” or “Fine Art” business, most of today’s printers have enough or even more resolution than you will need at 720 and 1440 dpi. The RIP or Raster Image Processor; is the “print manager” software that controls output to your printer. This is not a design program. This is a program that controls features like the size of the print, the quantity, nesting of different jobs and the most important part, the profile. Before buying a printer, decide if you need to print for the outdoor market or the indoor market. Any printer for the outdoor market can also print for the indoor market, however you can’t use an indoor printer for outdoor purposes. For example, if you want to print Vehicle wraps you will need an outdoor printer. Although most printers can print on a myriad of media, some people choose to use a very limited amount of different media because they have a niche market they sell to. If you want to be able to service many different markets, we suggest you make a list of everything you would like to print on to and its application. Use this list to help guide your decision when determining which printer will fit you best. It is highly recommended having your dealer do a full installation (even if you must pay extra) for several reasons. First, you want to be sure you are going to get the full manufacturer’s warranty when installed by a professional, certified technician. If anything falls or breaks during installation, this removes any liability from you and your company. Next, some dealers can set up the networking of the printer for you. This will save you from having to call in and pay a network specialist. It important to have your printer set up correctly so it can start to make you money as soon as possible. 1. Does the dealer have quality terms and conditions? Before making a decision on a purchase, make sure you get a list of exactly what is covered and how much time or how many days it will take. It’s important to know what you are responsible for and what your dealer will cover. You will need to deal with issues like resolution for creating images from scratch or how to pick the correct resolution for scanning an image and many more. 2. Does the dealer do all of the service work? Make sure your dealer does all of your service work; some resellers drop the service in the lap of the manufacturer after they take your money from the sale. When you call them, they give you the phone for the manufacturer. When you call your dealer, be sure you don’t have to use a credit card just to speak to a technician and get billed by the minute. Some dealers offer lifetime support for as long as you own your printer. Make sure that the dealer provides quality training. Not all training by all dealers is equal. Some may tell you they include training. This can be very ambiguous and open ended. Ask them what that means. They may only cover the printer display panel and its functions; for example, many subjects are related to the printer that aren’t listed in the display. What about the RIP? Are they going to teach you how to use all aspects of the RIP? The RIP can be more than a day of training. Although you may have to pay for training, the investment is typically paid back many times over. It starts paying off from day one because you will be able to use your printer and make money versus going the “I will figure it out” route that may take you days or weeks or longer. Training should be seen as an investment because it prevents you from wasting valuable time and money figuring it out yourself. There is a real benefit to doing business locally. Most service calls should be attended to within a day or two. If you are hearing things like “5 days,” a week or longer, we suggest you find another dealer to work with. Another thing to consider is post-installation questions. After purchasing a printer, you’re bound to have some post-installation questions. Be sure that they are available to assist you and find out how post-installation phone calls are handled. You shouldn’t have to wait around. Selecting the right type of ink is usually determined by your application. For example, if you are doing strictly indoor printing, you may use dye, pigmented, or aqueous inks. If you are in the outdoor world, your choice may be more difficult as there are many different types of outdoor inks to select from, each having benefits of their own. Aqueous inks are water based/ dye or pigmented ink. No ventilation is required and they are no threat to anyone’s health, however they are usually more than twice the price of outdoor inks and require specially coated media for printing that can be as much as 30-70% more in cost as compared to Solvent, Eco Solvent, Latex, or UV ink media. Hot solvents are an older style of ink that require ventilation due to dangers to people’s health. Hot solvent inks offer a warranty against discernible fading at the 3 year mark outdoors or 5 years with the correct lamination. Eco solvents are at a very similar price to hot solvents. Eco Solvent inks are a newer and safer ink that does not require ventilation. They offer the benefit of a warranty against discernible fading at the 3 year mark outdoors or 5 years with the correct lamination. Eco Solvents have options of white inks and metallic inks for specialized application printing. UV inks are inks that are cured by ultraviolet light. They have a similar price point to Eco and Hot solvent inks and will print on a larger number of surfaces however they may not be as durable as Eco and Hot solvent inks when it comes to fading or abrasion resistance they have a two year fade warranty. UV inks can even offer some special options like white and clear. Latex ink is similar to water based house paint. No ventilation is required. Latex ink prints very nicely on fabrics and backlit films. 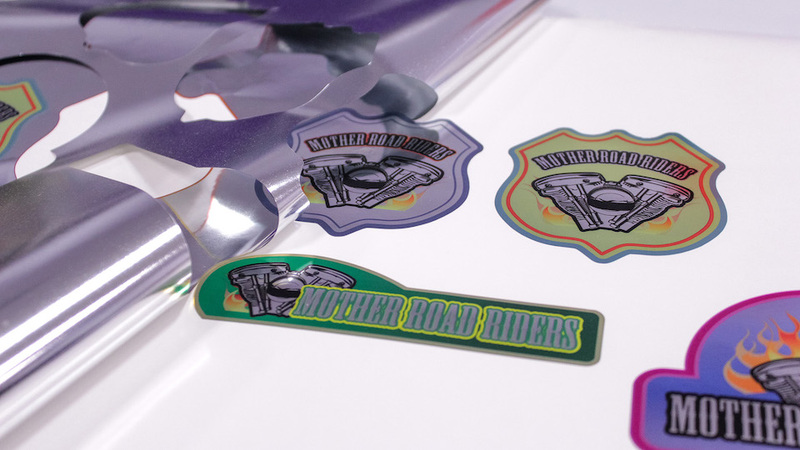 Because there is no outgassing, Latex ink images can be immediately laminated, however they may not be as durable as Eco and Hot solvent inks when it comes to fading or abrasion resistance. They have a two year fade warranty. For the outdoor market, there are really three inks to consider: Eco Solvent, UV ink, and Latex ink. The price is very similar in all three cases; It ranges from 18 cents per square foot to 24 cents per square foot which mean, on a 4’ x 8’ banner, the difference is less than $2.00 between all of these inks. That is certainly not enough to have a competitive impact price-wise. In our opinion, Eco Solvent is the best all-around choice for the outdoor market. 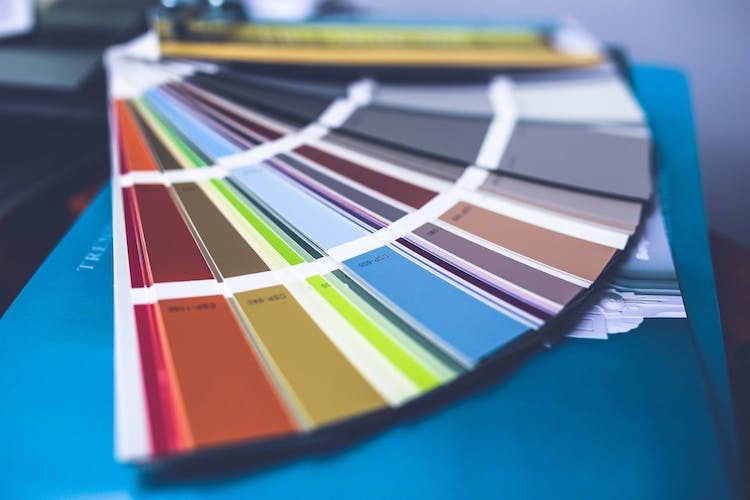 The number of colors your printer uses will determine things like quality of color images such as good flesh tones, bright spot colors, and a larger overall color spectrum as well as special effects or special applications. CMYK: In the print industry, we came from the standard four color printer (CMYK, Cyan, Magenta, Yellow, and Black) which makes 16.8 million color combinations. Four color printing is fine for most signage applications and new startup companies. There are now choices like the more popular 6 and 8 color machines for the more advanced companies or people who want enter into the specialized application markets. CMYKLcLm: Cyan, Magenta, Yellow, Black, Light Cyan and Light Magenta. When light cyan and light magenta are added to CMYK the results will be better flesh tones, smoother gradients, and a slightly bigger color spectrum. CMYKLcLmOG: Cyan, Magenta, Yellow, Black, Light Cyan, Light Magenta, Orange and Green. This color combination gives you all of the benefits of CMYKLcLm plus a brighter, better spot color. This color combo plus the 12 color systems are primarily used in the Fine Art and Gray scale printing applications so I am not going to go into 12 color. First: W, white, which is used for sub-surface printing applications and printing on colored surfaces (other than white). In this case, it can serve as a “primer” of white, used before printing color on top or printing white on clear for things like window graphics. Second: Lk, Light Black will give you enhanced gray scale printing of Black and White Photos. Third: Mt, Metallic silver ink will give you the ability to take any color and give a metallic look for extra pizazz - this is great for that client that’s looking for a “different” look. CMYKLcLmWMt: Some of the newest printers on the market now offer several color options: Cyan, Magenta, Yellow, Black, Light Cyan, Light Magenta, White and Metallic. CMYKLcLmLkMt: Cyan, Magenta, Yellow, Black, Light Cyan, Light Magenta, Light Black and Metallic. CMYKLcLmLkW: Cyan, Magenta, Yellow, Black, Light Cyan, Light Magenta, Light Black and White. Purchasing a printer from a reliable manufacturer with a long history and good reputation pays off down the road. Buying from quality manufacturers typically leads to less maintenance cost and higher resale or trade-in price. You will also find that parts are local and do not have to be ordered from another country that could take 6 weeks of costly downtime. Big names are usually known for big customer service when “it” hits the fan. Always ask about the cost of extended service plans for when the manufacturer’s warranty expires. Some salespeople don’t always offer much information about their equipment’s warranty or extended plan especially if they have something to hide. Extended service plans are usually 10% of the original cost of the printer. If you find the cost to be significantly higher this may tell you something about the reliability or breakdown frequency of the machine which could result in costly downtime. Some printers are strictly “print only.” This means that you must purchase a second plotter to do the cutting aspect of your job. With “print only” printers, you would print with one machine, then move it over to another machine to do the decal cut. Other printers have the plotter cutter built into them. As soon as the printing is done, the machine will proceed with the decal cut. If the job requires lamination, you could remove the print, put it through the laminator, and then reload it in the printer for it to be decal cut. Although you will pay a little more for a printer-cutter it is certainly less expensive than purchasing a printer and a second plotter for cutting. In addition, the service cost for two machines is bound to be higher. Over the years, we have heard two schools of thought on this. Some say you shouldn’t get a printer-cutter because if the machine breaks down, you don’t have either printing or cutting. This is pure bunk; it’s nuts. That’s like saying you shouldn’t get air conditioning in your car because it may break. Yes, anything can break, but you are not buying it for when it breaks, you are buying it for the other 364 days a year that you get seamless production. The other school of thought is to keep the printer printing and not disrupt it to do the cutting. Although there is some credence to this school of thought, if your print production schedule is so busy that you need a standalone cutter, one can always be added to a printer-cutter machine. This allows you to start out by spending less money, then down the road, if you need a standalone cutter, one can be added for no more additional cost than if it were done at the time of the printer-cutter purchase. This gives you the best of both worlds. If printing is not busy, the printer-cutter can do both jobs and if production picks up, you can move work to the cutter. When it comes to deciding what to buy, most people think that the price of a printer is the most important factor. Although price is a consideration, it should not be the driving force for decision-making. You’re not buying the printer for what it costs; you are buying it for what it can do. This is an investment purchase, because you are buying a printer for the “return” or how much money it can make you. After all of this I’m sure you have learned there are more things to consider than you realized. Combining all of your new knowledge and putting the emphasis in the right place will get the best printer for your needs. Still not sure? 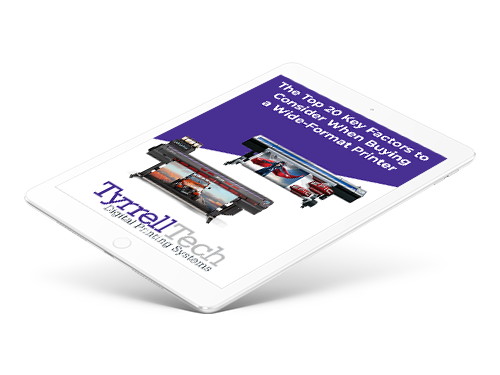 Get the full Top 20 Key Factors to Consider When Buying a Wide-Format Printer.